Here’s a compilation of links to recommendations on numerous camera cases, pouches and bags for the Canon Powershot G11. I got it yesterday and love it. Don’t plan on carrying many accessories in this bag, but if you want the most compact case for your G11, this one is great. Holds only the G11 plus Op-Tech wrist strap, but a perfect fit and quick on and off my belt with Velco beltloop. Here’s a photo of the beltloop on the Tamrac 5689. A discussion on the German-language dslr-forum.de forum has more pictures of the Tamrac 5689 alongside other cases and the older Canon G10 camera. Here’s Google’s English translation. The only other things I like to carry with my camera is a spare SD card and battery. The SD card fit fine, but I was a little disappointed that there did not seem to be room enough for the spare battery. I cut a 3¼”x 2¼”x 1” thick piece from a sponge. That piece fits perfectly in the bottom of the case, with still enough room for the case cover to be closed while the G11 was in the case. From the bottom of that piece of sponge, I cut out a notch that was the same size as the spare battery. This worked fine since the battery is approximately 2¼ ” long. If you place the battery on a surface like a desk, and place the fitted piece of sponge on top of it, the battery cannot be seen from the top view (only the battery ends, along the 3¼” sides). Now the battery sits on the very bottom on the case, and that piece of sponge straddles or “bridges” over the battery. There is more than a quarter of an inch of padding (sponge) between the battery and the camera body. In addition, the cover closes just fine. Admittedly the battery is a little “buried” at the bottom of the case, but it’s not that difficult to get to when needed. The Tamrac 5292 is available in black, blue and red. The G11 fits perfectly in the case with room for the neck strap folded up on top. It has a small pouch on the front which can easily hold a spare battery and memory card. No doubt it is a little bigger than the Tamrac 5689 but it is comfortable when attached to my belt. The is a beautiful leather case for the G11 which is unfortunately, at the time of writing, not available in the USA. However, Amazon UK has the Canon SC-DC65A . Alternatively, you could consider purchasing the SC-DC65A case from reputable sellers on eBay. I think it is great but certainly not cheap. The case is only 44% leather with several other materials but I could care less. It is a terrific fit for the G11. I have tried both leaving the flap hanging and also removed it to leave in the car. […] I want to add that the entire back of this case is open to allow full movement of the screen. Despite this the case has a snug enough fit that it does NOT feel loose. No complaints from me. The G10 plus leather case photos in this German-language forum post (Google’s English translation) should give you an idea of how the SC-DC65A works with the G11. DPReview has two images of the G11 and the the SC-DC65 case. Teski has photos of the G11 in the yellow version of the SC-DC65 case. He purchased from the same eBay seller, JP Gift, mentioned earlier. A little searching shows that JP Gift carries the yellow (SC-DC65C) and brown (SC-DC65B) versions of the case. Have it on my G11 as we speak, and it works very well. Fits nicely, and the left side (from the back) is very shallow to allow for the LCD rotation. Very pleased. The case doesn’t stink, incidentally, although I was afraid that might be a problem. No odor at all, not even a leathery smell. […] during term time I often shoot a couple of photos to use for illustrations for something for my PSE class, then need to transfer those, and I’m getting tired of having to unscrew the bottom half of the case all the time with my G10, so I’d rather have something that comes off completely at once this time. Several cases get mentioned in this forum thread. Tamrac 5689 — recommended by PC Wheeler and John TF. Lowepro Rezo 50 — recommended by DavidPJ and infocus. I bought both the Canon PSC-5100 and the Lowepro G-Res 10 (which seems to be only available at Amazon). The PSC-5100 is more of a covering; when you carry it on around your neck/on your shoulder, you use the camera’s neck strap. It looks the nicest of all case options: it’s made of leather (or fake leather), the interior is lined with a nice black felt, and its flap has a magnetic clasp and so has the least bulk. I didn’t like it at the end, because it also looks boxy and when I removed the camera from the case, I found I had to stuff the case somewhere else. You could put the case on a belt strap, but, the case’s belt loop will eventually fail —- it doesn’t look that strong. Also, I found the neck strap that comes with the camera to be a bit short for carrying the camera under an arm. The camera goes into the case bottom first (e.g., camera held landscape orientation) and the case is snug enough to require pulling both ends of the neck strap to get the camera out (pulling only one edge of the strap causes the camera to rotate, making it harder to remove from the case). Lastly, the PSC-5100 case has no room to stuff the neckstrap under the flap (which is what you want to do if you carry it on your belt). The G-Res 10 is made of nylon, has a plastic clasp (which adds a little bit to the bulk —- no zipper), and a belt loop (which is a lot more secure than the PSC-5100’s). Its removeable should strap is adjustable and long enough so that I can comfortable carry the bag under my arm and allows me to carry the case easily with the camera out. Since there’s no zipper, I can pull the camera out easily. There’s a little room under the flap to stuff the camera’s neck strap, but, it’s awkward —- you have to take the time to neatly fold the strap and then hold it down with the case’s flap. The camera goes into the case along one edge (i.e., the case holds the camera in the portrait mode orientation). The G-Res 10 is perfect if you prefer holding the camera with a wrist strap attached rather than the neck strap. You’d just let the wrist strap hang out and can quickly pull the camera out or put it back in the case. Since neither case has a zipper, these cases won’t protect the camera from the elements. The PSC-5100 has a big cut outs for the neck strap to stick out. I considered the Tamrac 5689. It had the least bulk of all, but, no shoulder strap. It’s essentially a skin. It does have enough room to stuff the camera strap into it quickly. The Tamrac 5693 holds a few things in the front pouch, but, looks too bulky. The Lowepro Apex 60 AW looks very promising. Detachable shoulder strap. Can easily stuff the camera into it. Weather covering. I’d probably have bought it if I didn’t decide to carry the G11 with a wrist strap most of the time. The case I plan to buy next is the Lowepro Apex 100 AW. This case should just big enough to carry the G11 with a compact flash (Sunpack RD2000 C). This is a minimalist case that has enough room to hold the camera, orientated portrait (i.e., small end in) and lets the wrist strap hang out. The case has a removable neck strap and does not have a front pocket. So it’s the least bulky case I own. To me, with battery, the Apex is a little bulkier than I wanted. It also uses a zipper instead of a flap and so would take a little extra time to get the camera in/out of the bag. However, the Apex 60 protects the camera better against the elements and has extra space to stuff in the strap. FWIW I just picked up the LowePro Apex 100 AW today along with a 270EX Speedlight, and an extra NB-7L battery. The Apex holds the G11, Flash, 4AA plastic battery holder and the extra NB-7L just perfect, with a little space for extra SDHC cards and similarly small items. It comes with an removable/adjustable shoulder strap but also has a wide belt loop for belt carry too. It’s also got the thick nylon side loops for attaching compatible accessory cases. […] the Apex 100 AW does have the adjustable divider with velcro so you can separate your accessories from the camera itself. Also, I found my mini 3-sectional metal desktop tripod and it also fits in the small inner pocket perfectly. So to summarize, it holds the G11, extra NB-7L battery, 270EX speedlight, SDHC cards, mini tripod, microfiber cloth, 4 x AA rechargeable batteries plastic case. Snail69 provided some photos of the Lowepro Apex 100 AW loaded with the G11 and other accessories. Today at Best Buy, I found the Edit 100 which is made by Lowepro and bought it. It works great for my needs. I carry my camera in the tour pack if the weather is bad. I carry the case around my neck in good weather when riding so I’m always ready for taking pictures. I used the Mountain Smith Cyber II (Size L) for the G10 and it fits the G11 great. Has a belt loop and room for an extra card/battery. After careful study of measurements and materials, I chose the Mountainsmith Cyber II (large). It’s only 1/2 thicker with same height/width measurements as the slim Tamrac 5689, yet has more robust padding and room to tuck a wrist or neck strap in. All for just $18! 4 Fun recommends the Mountainsmith case too, and also linked to the Vanguard Arlen 6A Digital Camera System Pouch, a very nice-looking case that can be purchased at Amazon UK . Just got my G11 and can verify that the Kata DF-408 is a VERY NICE, snug fit. There is absolutely no extra space anywhere, in fact the camera will stay in the case if you hold it upside down with the lid open. You could fit a memory card in the front pocket, but that is about it. 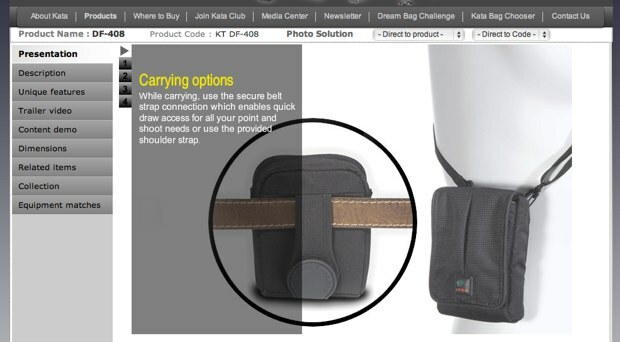 While carrying, the Kata DF-408 lets you “use the secure belt strap connection which enables quick draw access for all your point and shoot needs or use the provided shoulder strap”. See Kata Bags for more images and information on the DF-408. I ordered the Optech Mini D and got it today. It is exactly what I was looking for in a small compact case for the G11. It fits snug but being a stretch type of material it fits great. With this case I can carry the camera in my jacket pocket where ever I go. The case when off the camera is so flexible it fits into a pocket with ease. A little pricey for what you get but well worth it if you looking for camera protection only. Caselogic TBC-303 — See here for the official product website and customer reviews. Took my G11 to Wally World today to find a case and found one that fits perfectly. It’s the Case Logic Model TBC303. Has a belt loop, a small carabiner, and a front pocket for memory cards. $9 plus tax. It fits exactly right. Not too tight and not too loose. Hoped this info would save someone some time and trouble. The front pocket works fine with one battery but I wouldn’t want to try to put in two of them. I got my Case Logic TBC303 at Fry’s Electronics near Portland, Ore. It cost $9.95 (no sales tax in Oregon). I especially like having the camera ride horizontally, rather than vertically, on my belt. The case is easier to wear beneath jackets than a vertical case would be. Also, the belt loop is narrow enough to allow me to slide the camera around on my belt for most comfortable positioning as I sit, walk, etc. I compared the case with a dozen or so others, and it’s the least bulky I could find. It has enough padding to protect the camera well and is a very nice case. For those using the G11 with a camera strap, ehazera points out that the Caselogic TBC-303 would be able to take in the camera strap. Good luck shopping for your G11 case!